The Classic Brass Urn with Brushed Pewter Finish is a solid brass urn with a brushed pewter finish accented by three black rings. It is hard to say how long this urn has been around. We've had it for six years and it is still one of our most popular urns. 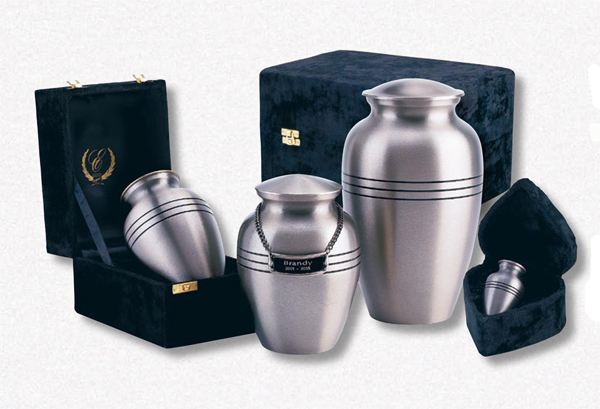 An edearing favorite for families that want a simple, traditional urn. Top loading with secure threaded lid. Felt base. These urns can be personalized by purchasing the Large Medallion Name Plate for the large urn or the Small Medallion Name Plate for the Medium and Small size urns. The name plates are attached to a chain which hangs around the neck of the urn. Please limit the engraving for the Large Medallion Name Plate to 26 spaces for the name and 32 spaces for the dates. For the Small Medallion Name Plate, please limit the name to 22 spaces and the dates to 28 spaces. Keepsake size is available under our Keepsakes category.